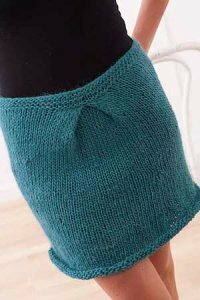 Taken from Knit.Wear - Premiere 2011: "Hourglass shaping and a single deep tuck give a simple tube skirt just enough interest." This pattern is in Knit.Wear - Premiere 2011, page 90. Size US 13-24" circs and US 13 DPNs (or size needed to obtain gauge) are required but not included. Finished Size: 27.25 (32, 36, 40, 44)" waist circumference. Color Shown is #052 Teal.